A new Instrument for the Accurate Determination of the Viscous Properties of Newtonian and Non-Newtonian Fluids at Ultra High Pressures. 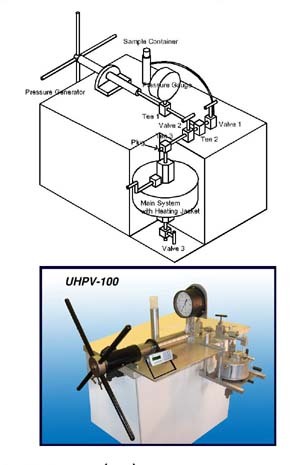 The Ultra High Pressure Viscometer (UHPV-100) consists of a metal needle with hemispherical ends falling vertically in a fluid with its longitudinal axis along the axis of a cylindrical container. A measurement of the needle terminal velocity allows a determination of the viscous properties of the test fluid. With the UHPV-100 the needle falling time is measured automatically by means of Hall sensors and a magnet in the needle. Adhesives, Aerosols, Automobile Fluids, Biomaterials, Coal Slurries, Coatings, Colloids, Cosmetics, Creams, Dairy Products, Detergents, Dispersions, Emulsions, Fertilizers, Foams, Fuels, Gels, Grease, Honey, Inks, Ketchup, Latex, Lubricants, Mayonnaise, Milk, Oils, Ointments, Paints, Petroleum, Polymers, Proteins, Pulp, Resins, Shampoos, Slurries, Soaps, Solutions, Surfactants, Suspensions, Varnish and many more at atmospheric pressure and high pressures.